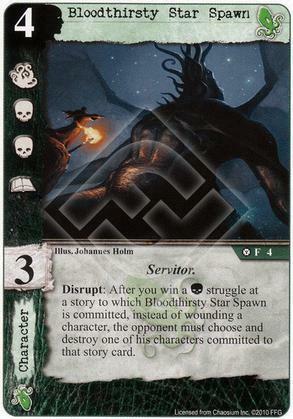 Disrupt: After you win a Combat struggle at a story to which Bloodthirsty Star Spawn is committed, instead of wounding a character, the opponent must choose and destroy one of his characters committed to that story card. Like Ian Hardaway, Bloodthirsty Star Spawn also seems like a natural fit in a Shub/Cthulhu deck. (Can you tell I'm considering splashing green into my current red deck?) I've found Shub to be ponderously slow at dealing with characters who have Toughness or Invulnerability. Shub seems to assume that all opposing blockers will die from a single wound. Trying to slog through stories against such blockers, gaining 1 success token at a time, makes for an agonizing experience. One time, I won two quick stories and got 4 tokens on a third (that's 14 unanswered tokens) before my opponent shut me down with Cthylla and came back to beat me. Insert Bloodthirsty Star Spawn: no more Toughness and Invulnerability to protect the opposing blockers, not even for Ancient Ones. Problem solved, and there's no need to resort to a sub-par like Bast's Hunt to do it.